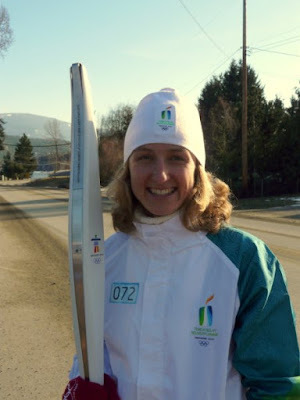 I took part in the Olympic torch relay in Blind Bay British Columbia. A beautiful little town about 75km from Kamloops. The torchbearers arrived and were briefed on what was going to happen, We were shown how to light the torch and encouraged to try running with it so we knew how it would feel. With full fuel the torch wasn’t the only thing burning! From our meeting point we were bussed to our run point. Along the way we watched videos featuring amazing Canadian athletes like Clara Hughes (medals in cycling and speed skating) and Cindy Klasen (5 speed skating medals in 2006). We also watched a video showing the torch relay which definitely helped us get excited to run. The energy among the torch bearers and the collection of stories we shared made it a very memorable experience. The bus dropped me off to my awesome “family” fan club. Thanks guys! And I waited for the torch to arrive. Seeing someone running towards you (Tyler) with the torch is a beautiful moment, as is holding up your torch to accept the flame. Despite the burn in my arm the smile never left my face, even as I passed the flame on to Don and he ran onwards to the cheers of his children. Feel free to share them or embed them on your site.